Yeah, claiming land is a silly thing. Claiming places where there's no land is even sillier. It's mine! No, it's MINE. Time to declare an international region like Antarctica. Before the silliness overwhelms us. 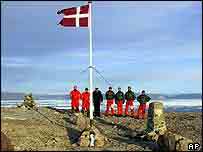 Denmark claiming the North Pole I do not think they are gonna get away with it this time like they got away with Greenland. Before Greenland seemed worthless to everyone and let Denmark take it, now they have plenty of reasons to claim North Pole cause natural gas or oil could be found and in our society is ALL ABOUT MONEY! Actually - the adress to santa claus is somewhere in sweden ;) I have it in a book i bought. With published wish-lists.